The Kuala Lumpur Tower (KL Tower is a communications tower located in Kuala Lumpur, Malaysia. Its construction was completed on 1 March 1995. Menara KL Tower is easily Malaysia’s most recognizable and popular landmark, the view is marvellous during the day and even better at night when you can see the entire sparkling city centre. The tower is erected atop the Bukit Nanas (Pineapple Hill) Forest Reserve – the oldest gazetted forest reserve in the country, which houses age-old trees as well as flora and fauna indigenous to Malaysia’s tropical climate. Primarily used as a communications infrastructure, it is the fifth-tallest telecommunications tower in the world. When Menara KL Tower was constructed the overall design was meant to represent the human journey for perfection in life. The tower’s architectural-style reflects Malaysia’s vibrant Islamic heritage with Arabic scripts, Islamic tiles, and archetypal Islamic floral and abstract patterns. Revolving Atmosphere 360 restaurant at Menara KL Tower Hailed as one of the tallest freestanding structures in the world, Menara KL plays host to a revolving restaurant, Atmosphere 360. You can have a meal or enjoy high tea along with the most spectacular view of the city centre, bar chartering a helicopter. Boasting a theatre, an amphitheatre, beautiful cascading pools, a fast food restaurant and souvenir shops, this tower is a definite must-see sightseeing attraction when you visit Kuala Lumpur. 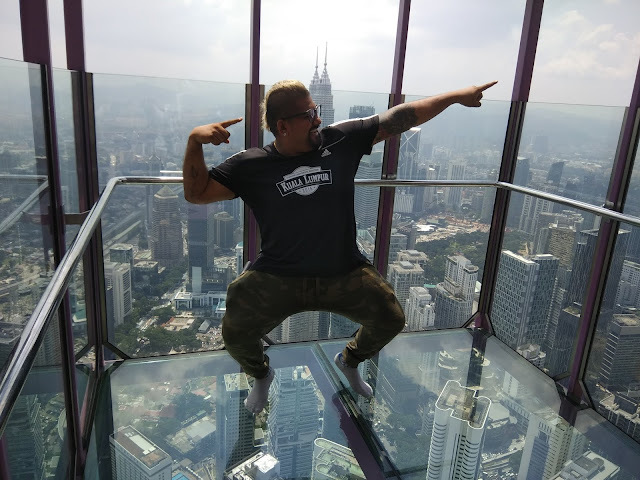 Sky Box, Enjoy this latest thrilling experience at KL Tower Sky Box. At 300 meters up, the Sky Box extends out from the Sky Deck ledge. 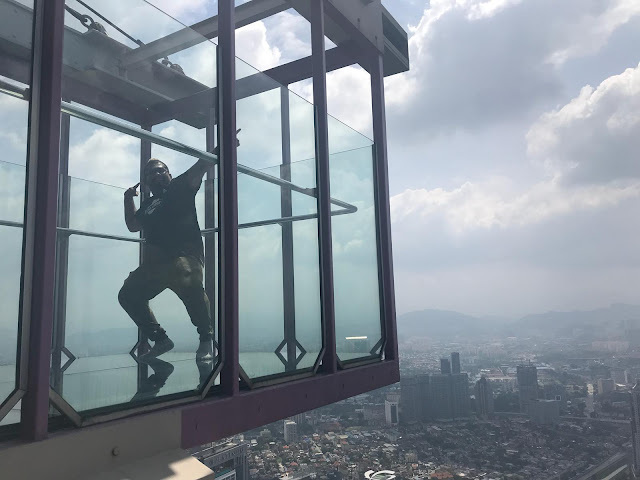 It is a unique experience for visitors to enjoy the panoramic view of Kuala Lumpur. Feel free to let out your inner diva and modeliing dreams with any pose in the Sky Box, as your picture will turn out simply amazing! 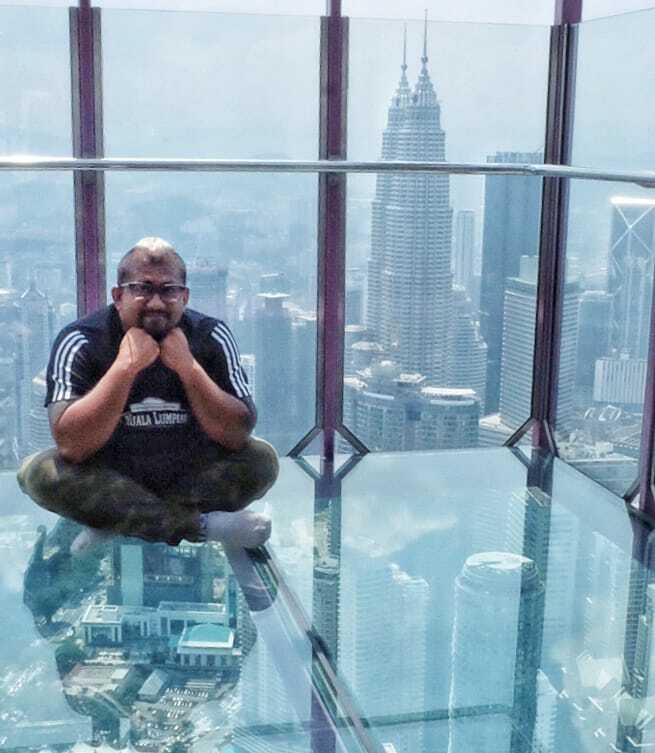 Enjoy a unique and unobstructed view of the city from the top of KL Tower.